PACKAGE THIS TITLE WITH OUR 2016 MLA SUPPLEMENT, Documenting Sources in MLA Style (package ISBN-13: 9781319086848). Get the most recent updates on MLA citation in a convenient, 40-page resource based on The MLA Handbook, 8th Edition, with plenty of models. Browse our catalog or contact your representative for a full listing of updated titles and packages, or to request a custom ISBN. 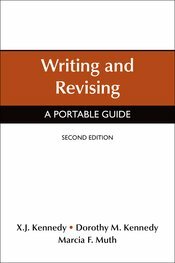 A concise and affordable yet thorough writing guide, Writing and Revising offers a true alternative to larger and more expensive texts. Widely adopted in the first edition, it's flexible enough to be used in a variety of courses, as a classroom text, or as a quick reference. Whether students are writing brief papers or more complicated essays drawing on multiple sources, Writing and Revising can help. "A true alternative to bulky, heavier, more expensive textbooks; yet it offers the essential information every writer needs to know."